Tom Scanlon is going to be reviving Celtic Crossroads here on WVOF! After you listen to tonight’s game on WICC tune over to WVOF and hear our student broadcasters and fanatics discuss the game and take your calls! The broadcast will start at around 8:30PM TONIGHT! Unfortunately the annual Exhibition basketball broadcast has succumb to Hurricane Sandy. Our student broadcasters are stuck off campus and can’t return to call the game. We are all sorry for the inconvenience and hope that you will join us for the rest of our Men’s and Women’s coverage this season. Whether you are a returning student DJ, a new member and want your own show, want to join the WVOF Sports Team, want to join the WVOF Music Team or are interested in becoming a Work Study, or have any questions what so ever, please attend our First General Meeting TONIGHT night at 9 pm in the Mezzanine in the upper level of the BCC (area above the new Einstein Cafe). If you miss the meeting and still want a show on WVOF stop down to our offices anytime! Taking Back Our Community Radio on WVOF 88.5FM will Sponsor our 5th Annual Back To School 3 on 3 Ball’N Tournament & Talent Showcase. This year’s host will be a group of young vivacious Sisters, We Are S.E.T (Sisters’ Empowerment Team) who is going extremely hard to make sure everyone will be not only be safe, entertained and well fed, but also encouraged and empowered at the beginning of the school year. Joined by 2X’s 1996 & 1997 WNBA Champion, sports commentator, author of an inspiring book “If You Don’t Quit, You Will Win” the gifted and talented Yolanda Moore, she will motivate our students in our community to not give up! Also, there will be entertainment before the championship game by recording artist “Gabriel Brunot & Rahmad Chase Fields” moonbouncer, kickball, DJ by Clear Image Entertainment, tug of war contest, slam dunk contest, face painting, vendors and much much more! So come out and enjoy a fun filled family day free to ALL! Lastly, this year, ALL AGES CAN REGISTER TO PLAY THE 3 on 3 Tournament. 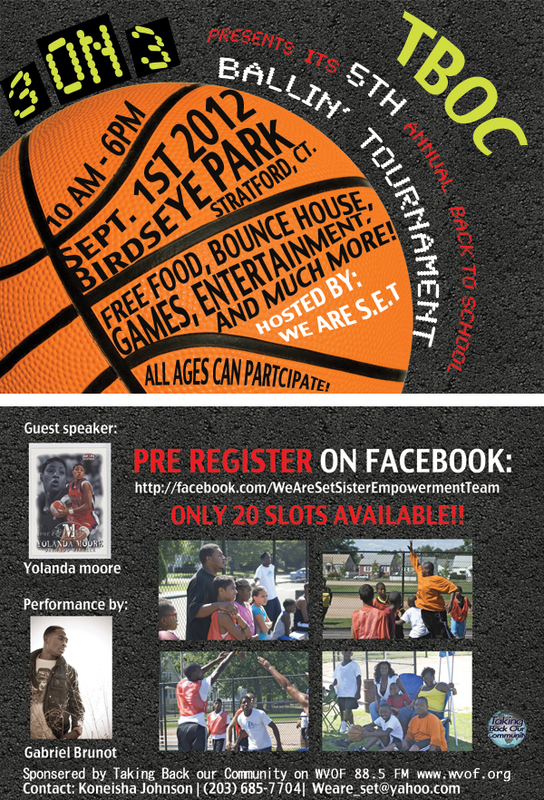 Adult Team over 18 years of age, we ask when registering, you can register online http://facebook.com/WaAreSetSisterEmpowermentTeam, to please leave a donation to help for this free event. We thank you in advance and see you all Labor Day Weekend in September 1, 2012 at Birdseye Field in Stratford! Our program director and station manager are currently covering the Gathering of the Vibes music festival taking place at Seaside Park in Bridgeport!! Keep checking in to our facebook and tumblr pages for more pictures and updates from the festival! WVOF at Vibes on 7/22! Tune into our FM Stream this sunday to hear our exclusive broadcast from the Gathering of the Vibes music festival in Seaside Park! Get the iPhone, iPad and iPod touch app here! Our most recent twitter post, follow us!